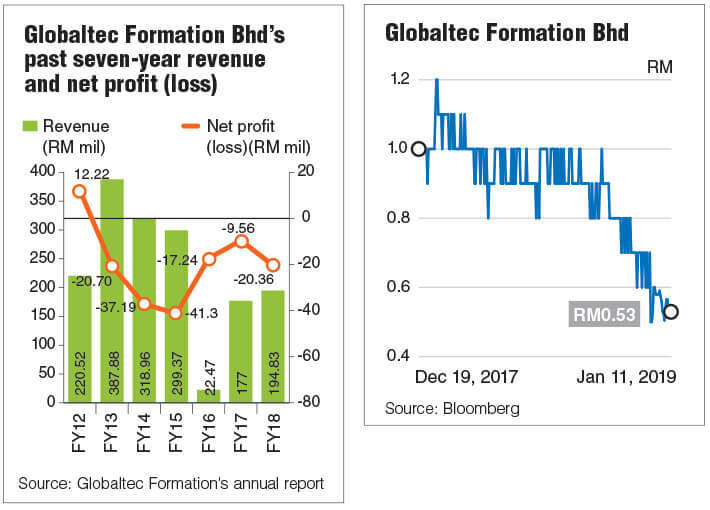 KUALA LUMPUR: Globaltec Formation Bhd’s turnaround in the first financial quarter ended Sept 30, 2018 (1QFY19) has its top executive convinced that the automotive parts manufacturer’s worst days may be behind it. The group posted a net profit of RM956,000 in 1QFY19 compared to a net loss of RM227,000 a year ago, on the back of an 18.7% increase in quarterly revenue to RM54.64 million from RM46.03 million in 1QFY18. Its founder and group executive chairman, Tan Sri Goh Tian Chuan, attributed the improved quarterly results to the streamlining of its operations in the prior financial year ended June 30, 2018 (FY18). This included the rationalisation of its facilities to become leaner and more cost-efficient. In Selangor, the group had consolidated the number of facilities from three to two. On top of that, the group had disposed of its loss-making 92%-owned subsidiary, AIC Semiconductor Sdn Bhd, to further strengthen its balance sheet. The 57-year-old Goh, who is also a substantial shareholder of Globaltec with a 19.81% stake as at Dec 26, 2018, believes the worst is behind it and is confident that the group will see a return to full-year profit in the current financial year. It has been making losses for six straight years since FY13. The group had missed its turnaround goal in FY16 due to overall weak demand in its semiconductor and automotive divisions amid slowing global growth and lacklustre local business environment. This time, the group is banking on the Proton-Geely collaboration to launch more car models, as well as growth from the precision machining, stamping and tooling (PMST) division to help drive up revenues. Proton Holdings Bhd currently accounts for 30% of the automotive division’s total revenue. Goh, however, pointed out that the positive impact from Proton’s first-ever sport utility vehicle (SUV), the X70, will not be immediate as the units come fully imported from China. Globaltec hopes to secure businesses from the X70 when the national carmaker commences local assembly of the SUV in the second half of this year, he added. According to local motoring portal paultan.org’s posting on Dec 28 last year, the local assembly of the X70 is slated to begin in October 2019 after expansion initiatives at Proton’s Tanjung Malim plant in Perak are completed. Goh shared that Globaltec has been participating in a “significant” number of request for quotations (RFQ) by Proton for its upcoming new car models. Under the RFQ, component suppliers like Globaltec will engage in competitive bids to supply specific car parts. “Some of them (products supply) have been awarded, while some are still pending a decision by Proton,” Goh told The Edge Financial Daily in an interview. “The strategy going forward is to work closely with the existing vendors of Geely in China, to bring that capability to Malaysia and localise it at a lower cost and ensure faster execution in delivery to create a win-win situation for both parties,” he added. The group will leverage on its collaboration with Ningbo Auto Components Industry Association and its members to extend their relationship with Proton-Geely in Malaysia and expand into the Asean market. Ningbo is a government body that represents over 200 enterprises from the automotive industry in Ningbo. On July 28, 2017, Globaltec’s wholly-owned subsidiary AutoV Corp Sdn Bhd had signed a memorandum of understanding with the association to develop and secure business collaborations between members of both companies. Under the partnership, the Chinese group will fully assist as well as introduce and promote AutoV Group as the ideal partner to its members. Ningbo members are existing suppliers of various reputable carmakers including Geely in China. Nevertheless, Goh said the group is working to secure more businesses from other car makers such as Toyota and Mazda to reduce its reliance on Proton, which had at one point contributed as much as 90% of the automotive division’s revenue. This over-dependence had also resulted in losses for the automotive division in the past, due to the decline in Proton car sales. The group has allocated up to RM20 million for its capital expenditure in 2019, which will mainly be used to expand its existing facilities in Jakarta, Indonesia to cater to buoyant growth and rising demand from customers. Goh said the plant — whose principal activities are in the PMST business — is currently running at near full capacity. As such, the group plans to build a second factory there, of which construction is expected to begin in the second half of this year. For its PMST business, Goh said the plant in Penang is also operating at full capacity. It has commenced its expansion phase to build a new 60,000 sq ft facility at the Penang Science Park. The RM10 million facility is slated to complete in the first quarter of this year. On its upstream oil and gas business, Goh said, Globaltec expects this energy segment to start contributing positively by 2020. However, much will depend on it obtaining approval from Indonesia’s Energy Ministry and Mineral Resources on its first plan of development (POD) for the Tanjung Enim’s production-sharing contract (PSC) field in South Sumatra, Indonesia. “We can only move to the next milestone [to commence commercial development for coal bed methane] after the minister signed the POD,” he added. Globaltec’s Australia-listed 65%-owned subsidiary NuEnergy Gas Ltd had in January last year received Indonesia’s certification for the Tanjung Enim production. The certification had confirmed a total gas reserve of around 165 billion standard cubic feet (Bscf) or the target development areas covering 33 sq km. “Assuming a gas price of US$7.50 per million british thermal units (MMBtu), 165 Bscf will translate to a gas value of US$1.2 billion. We are working hard how to monetise this,” said Goh. He added that the PSC is for 30 years, with 21 years left to go. “We foresee this (energy) segment could potentially become one of the largest contributors if all plans were to go smoothly. Currently, Globaltec operates six PSCs in Indonesia, of which five coal bed methane fields are in Sumatra and the remaining field is in Kalimantan, measuring a combined 5,500 sq km. Over the past year, Globaltec’s share price has dropped by 47% to close at 53 sen on Friday, giving it a market capitalisation of RM142.62 million.